A lease agreement is a legal contract between two parties where by one party allows the other to use its particular asset for a specific period of time in return for a nominal regular payment. The party using the asset on the lease is called the lessee while the party giving the asset on the lease is called the lessor. The time period for the lease agreement is the lease period and the return or payment is known as the lease payments or rentals. What is lease termination form? Mostly the term for a lease is specified in the lease agreement and as soon as the time period is completed the lease ceases to exist. But in some scenarios, the lessor or lessee may want to terminate the lease before the completion of the lease period. In such a situation the lease termination form is used by the mutual consent of both the leading parties. 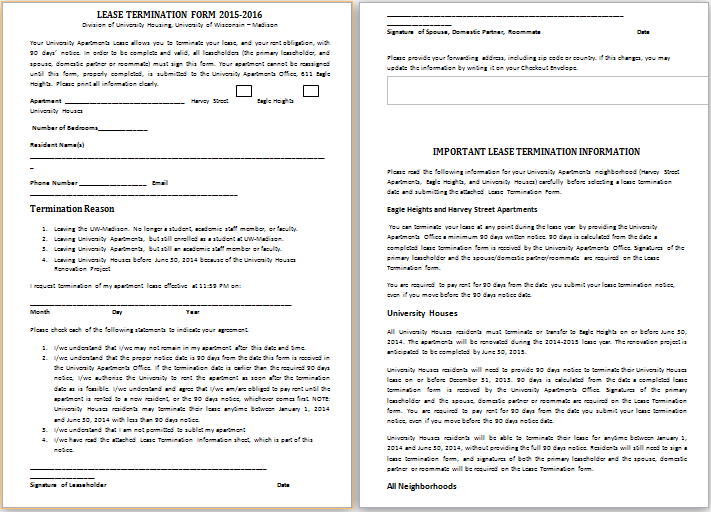 This type of a lease termination form is mostly used in situations where a lease agreement may not be present. The lease termination form is only applicable where both the parties to the lease mutually agree to end the lease contract. If one party does not sign the lease termination form it becomes ineffective. So both parties need to sign it.